EUCLID, Ohio - A 6-foot-4, 228-pound nearly blank canvas walked into Euclid Sports Plant two months ago. Tyreke Smith returns every week to shape himself as a football player. Six Division I colleges liked him enough to offer scholarships during a weeklong stretch entering May. That's not unusual this time of the year. It is uncommon for a sophomore like Smith, who has not played a down of football since seventh grade. "When you look at him, he looks like a man-child, " Cleveland Heights coach Mac Stephens said, "but all of a sudden these coaches are saying, 'Wait a minute, he's in 10th grade.' This is a 10th grader wearing a size 15 shoe and still growing." Smith played on the Cleveland Heights varsity basketball team as a freshman and again this year. Colleges have only his basketball footage and a small sample of Smith - without football pads - catching passes and running cone drills inside the Sports Plant. Of Smith's six offers, five are from Football Bowl Subdivision schools. The biggest so far is Iowa State of the Big 12, while three Mid-American Conference schools and Cincinnati also are believers. "I knew I was going to get looks and offers, but I didn't think it was going to come this early, " said Smith, whose older brother, Malik, will play basketball at UNC Asheville. "I thought they were going to come next year, after seeing how I did in the season." 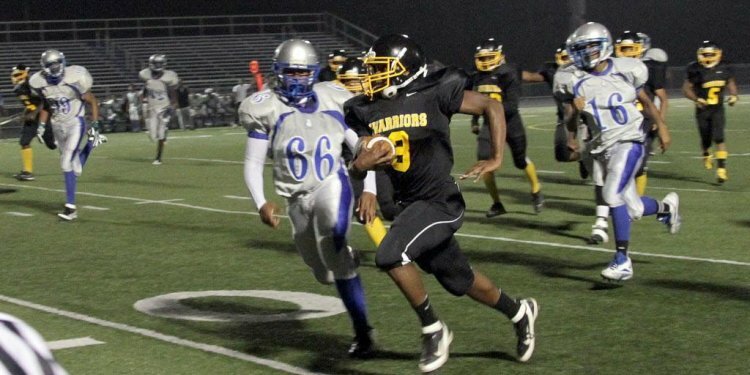 The football coaches at Cleveland Heights tried to persuade him to play last year. Basketball teammate and standout receiver Jaylen Harris also unsuccessfully lobbied him to try football. "I've been trying to get Ty to play since he got to Cleveland Heights, " Harris said. "He's got the body, the frame. Right now, he's doing everything right. He's putting in work." Stephens is so high on Smith's potential that he plans to coach tight ends and defensive ends, which he did not do last year as Cleveland Heights' first-year coach. Stephens played both positions in high school and remained a linebacker through his two seasons in the NFL. So far, Smith learned a spin move, club and whip. "He's got a pro spin move that 90 percent of college players can't perfect, " Stephens said. Then there's the martial arts. Stephens picked it up while playing for the New York Jets in 1990. Seattle Seahawks coach Pete Carroll, then the Jets' defensive coordinator, brought in an instructor to teach his players. Stephens took some classes on his own and integrated techniques with his coaching at Euclid and Glenville. Smith isn't breaking wooden boards for his coach, and Stephens said the instruction - a correlation of balance and form - isn't for every high school player. Smith is an exception with a 3.9 grade-point average and an athletic bloodline from his parents, who both played college basketball. "This kid, I can't go fast enough for him, " Stephens said. Their favorite is the spin move. Smith said he developed it playing hoops. "It was almost perfection from Day 1, " Stephens said, "so we're going to keep gradually introducing new things. Now it's a matter of teaching him football physics. When you're 6-foot-4, guys are going to hit you low, and you have to know how to use your body." Smith inadvertently gave offensive coordinator Kahari Hicks a preview of his force. Hicks grabbed a blocking bag Tuesday at the Sports Plant while everyone but Smith lined up wide to catch passes from quarterback Cam Searight. Smith positioned himself halfway between to mimic the distance for a tight end. Hicks snuck out to provide an obstacle. Smith ran 10 feet, turned around and caught a pass. When he turned back around, Hicks briefly stood in the way - still in a shirt and tie from school - until crashing to the floor from their collision. Woos echoed within the gym from teammates. "If he keeps doing what he's doing, " Harris said, "by the time the season comes, that offer list will keep stacking and stacking." Hicks smiled after bouncing off Smith, but he didn't grab that bag again. This story is part of cleveland.com's spring football series. Here are more details on the Tigers for the 2016 season. 2015 postseason: Lost to St. Edward, 20-12.